Your child’s well-being is your biggest concern and their oral hygiene is an important part of their overall health. The care of your child’s teeth and gums begins with you – – you can set them on the right path for a lifetime of excellent oral hygiene. Babies are born with all their teeth – you can’t see them because they are hidden in the gums. 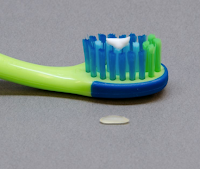 Baby teeth start to break through the gums around 6 months but it is important to start good oral care for infants even before the first tooth comes in. From healthy gums come healthy teeth. Wipe your baby’s gums with a soft washcloth after feeding. This helps remove the bacteria that can cause tooth decay. Once they begin to erupt, brush teeth twice a day with a fluoride toothpaste in an amount no more than a smear the size of a grain of rice – use a soft-bristle toothbrush. Please read the entire article, found at DentalCare.com, to see more detailed information on dental hygiene for children. Posted in at-home hygiene for children, kids dental care, youth dental care.